The DIY (Do It Yourself) revolution is here, and it is really changing our perception and breaking barriers of what it is possible. The Make Makazine brings some of the latest news on this topic. This revolution is making possible to create complex objects and projects to a vast number of people. 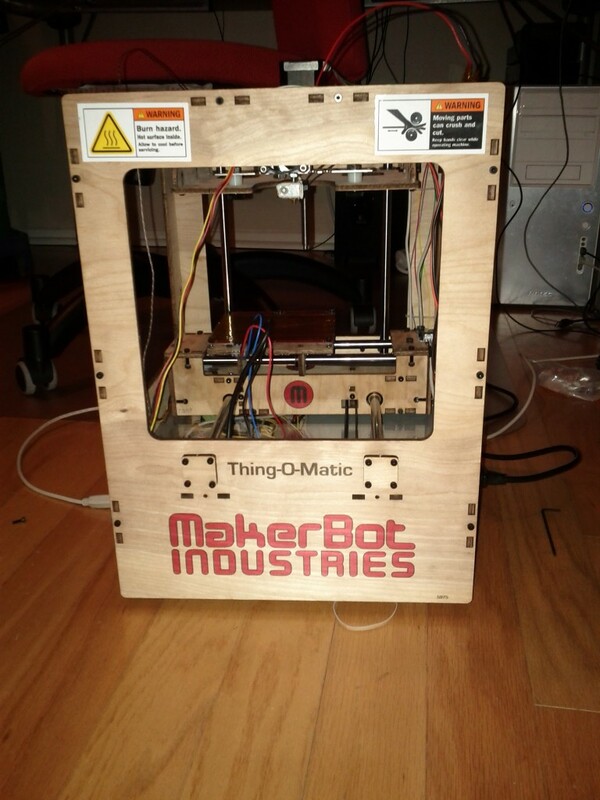 Take the example of the 3D printer the Thing-o-Matic made by Makerbot. It won’t be long before people have a 3-D printer sitting at home alongside its old inkjet counterpart. These 3-D printers, some already costing less than a computer did in 1999, can print objects by spraying layers of plastic, metal or ceramics into shapes. People can download plans for an object, hit print, and a few minutes later have it in their hands. Call it the Industrial Revolution 2.0. And as highlighted in the article, 3D printers do not only will change the nature of manufacturing, but they will further challenge our concept of ownership and copyright. However, we have had the same changes with tape and DVD recorders. The technology is disrupting the status quo, and opportunities and challenges will arise, as usual. I have just bought one Thing-o-Matic and it is an incredible machine. It is not for the general public, at least, assembling one of them requires soldering skills, taking care of a lot of nuts and bolts and a lot of patience. At the end, I have learned a lot, and it was worth it. The machine is just a small part of the overall system. It is the platform, once again, that makes this paradigm attractive and powerful. Just go to Thingiverse and you will have 3D designs to download and print, made by people around the world. AutoDesk, is making its powerful CAD software Autodesk 123D free to download and, at the same time it offers the tools and the services to print your creations. It is a complete different business model from the past and new opportunities emerge. AutoDesk believes that is better to experiment than to be left behind. Take Ponoko, your personal factory, a successful company able to deliver what hobbyists, students and artists design, by using 3D printers and laser cutting techonologies. The designs of those creations can also be sold and it is a space where creators can meet with the demand. In the area of electronics and DIY, companies like Sparkfun show the incredible demand for electronic components, sensors, microprocessors from hobbyists. The tutorials on the Sparkfun website allow almost anybody with some passion to make and create useful and sometimes not so useful stuffs, but it is fun. A link from Sparkfun brings you to BatchPCB, a website where you can order the PCB (printed circuits board) that you have designed or you can buy PCB made by others. Once again, the barriers to access to this world are lowered and people can create, share and sell stuffs. Arduino is another fantastic example of DIY platform. Arduino is an open-source electronics prototyping platform based on flexible, easy-to-use hardware and software. It’s intended for artists, designers, hobbyists, and anyone interested in creating interactive objects or environments. I have a few Arduino boards now and it is extremely easy to start and write simple programs that gradually become complex. Sensors, leds, wireless components can be combined to create unlimited applications and experiences. The platform allows the creations of additional add-ons, called shields that augments and facilitates the overall project. Android now supports Arduino for the creation of accessories, increasing the importance of this platform and its user base. And by the way, the Think-o-Matic 3D printer has at its core Arduino boards, the Arduino Diecimila is used for the extruder controller and the Arduino Mega 2560 is used for the main board. DIY Drones is another growing community around UAV. An Unmanned Aerial Vehicle (UAV) is an aircraft that has the capability of autonomous flight, without a pilot in control. Chris Anderson has started this community and the community has created a lot of software, hardware and drones that can fly. What they have achieved is not an easy task, for example: the DIY Drones community has created the world’s first “universal autopilot”, ArduPilot Mega. It combines sophisticated IMU-based (IMU Inertial Measurement Unit) autopilot electronics with free Arduino-based autopilot software that can turn any RC vehicle into a fully-autonomous UAV. To get started read DIY Drones A newbie’s guide to UAVs. Overall, we are clearly seeing the importance of the DYI revolution. A disruption that promises to lower the barriers to creation and enhance creativity. The mass-market is still the dominating paradigm, but at the same time there is an emergent trend towards making things they way we like and want and share those creations with many other people around the world. And exciting future is ahead.